Comments Off on Not a Trick – just a Treat: All Day Drop-In Advising Starts Today! Not a Trick – just a Treat: All Day Drop-In Advising Starts Today! Starting TODAY (10.31.16), advisors in the College of Management are available to see CM students with 60+ credits for drop-ins all day. Stop into our office (M-5-610) between 9:00-11:30am and 1:00-4:30pm and sign in for advising. You will have a choice to see your advisor or the next available advisor. We look forward to talking with you about your spring 2017 registration plans. Comments Off on Join Enactus UMass Boston! Enactus UMass Boston is currently recruiting for both new members and leaders to guide the organization into next semester and beyond! Enactus is an organization that connects student, academic, and business leaders through entrepreneurial-based projects that empower people to transform opportunities into real, sustainable progress. 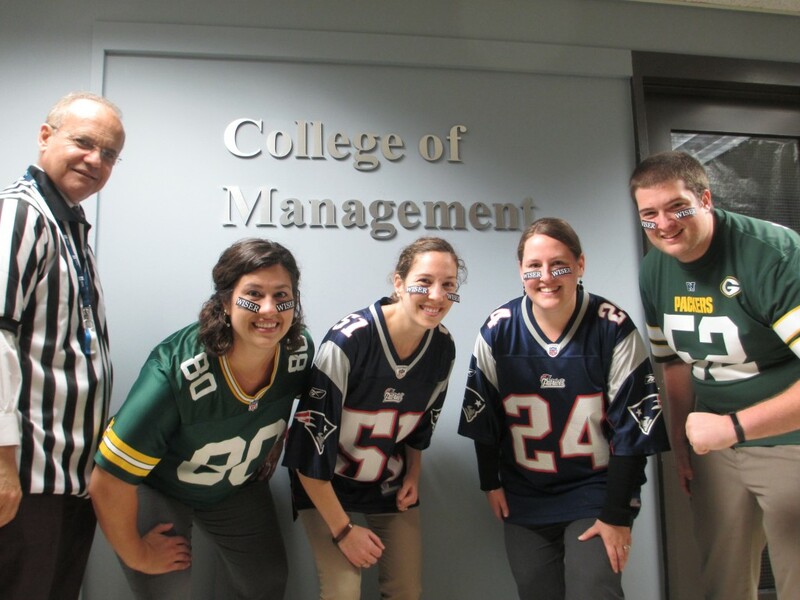 College of Management students can earn MAP Miles for being an active member of Enactus UMass Boston. Additionally, you’ll grow and develop diverse leadership skills that you can use in the workplace, and get the opportunity to use creative problem solving to generate solutions to tough issues, and you’ll get to engage the diverse UMB community in a variety of ways. 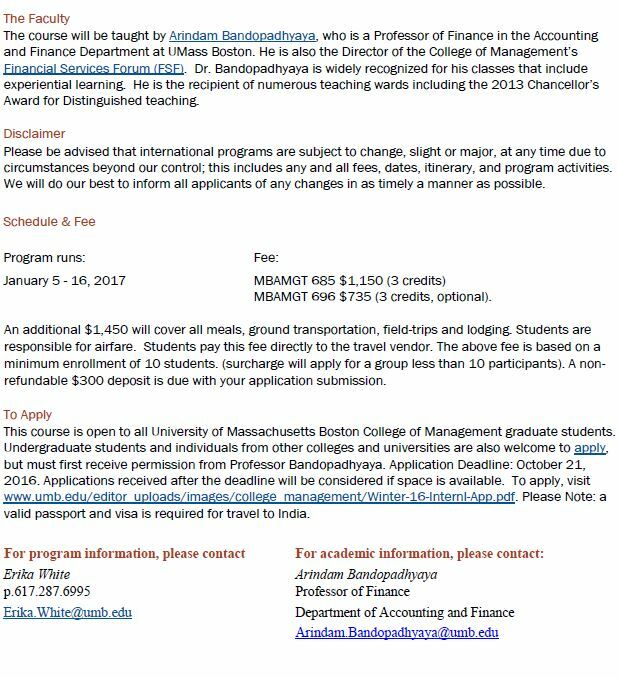 While Enactus UMass Boston is a club run by the College of Management, any interested student from any college/major can join! Let your friends know about this opportunity to get involved on campus! Happy Friday! Please see below for next week’s MAP events- and if you are planning to take MGT 490 in Spring 2017, make sure you have a plan in place to complete 80% of your miles. Happy Friday! Please see below for next week’s MAP events- and if you are planning to take MGT 490 in Spring 2017, make sure you have a plan in place to complete 80% of your miles. Also, be sure to check out our “Meet the Concentrations” events next week if you have not yet declared a concentration and aren’t sure which to choose. 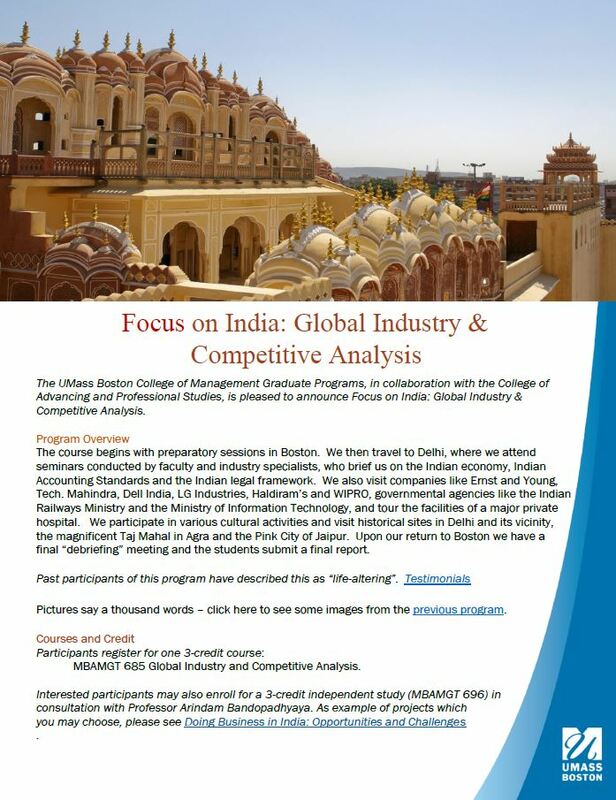 This winter (January 5-16, 2017), students from the College of Management will have the opportunity to complete a short study abroad trip to India and earn 3-6 credits for the experience. While initially developed for graduate students, College of Management undergraduate students are also invited to apply and enroll in the program. For more information, please attend the information session on October 14, 4:30 – 5:30, in the College of Management Dean’s Conference Room (M-5-618). You can also view a video about the program here: https://www.youtube.com/watch?v=Vda0I05ZwBk&feature=youtu.be. The application deadline is October 21, 2016. Contacts for additional information can also be found on the attached 2 sided flyer. Are you Graduating December 2016 or May/June 2017? 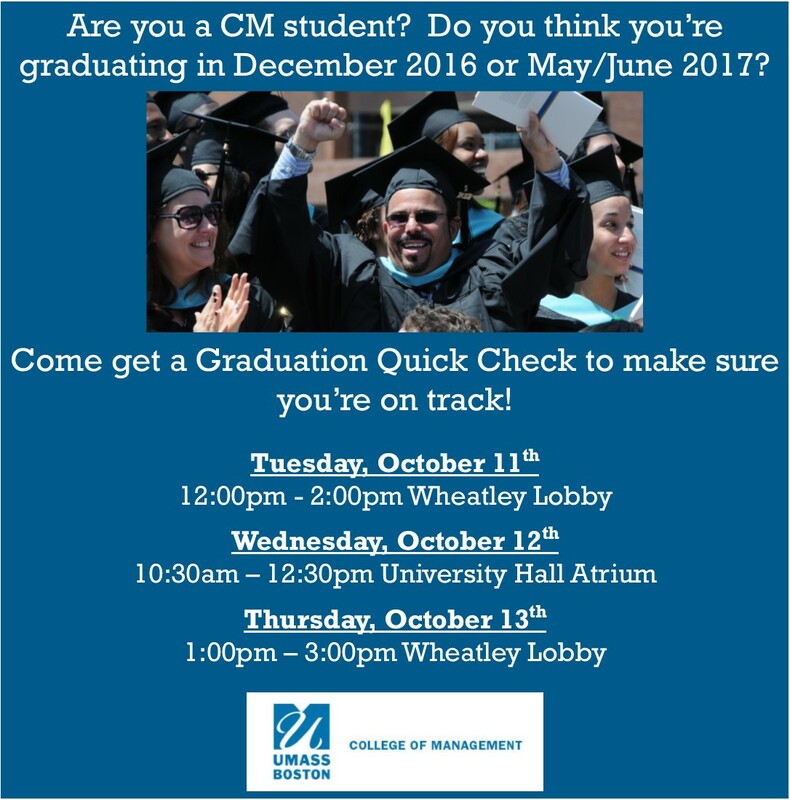 Come get a Graduation Quick Check to make sure you’re on track!! Comments Off on All Day Drop-Ins TODAY!!! We’re Kicking Off Advising for Spring 2017 Registration with All-Day Drop-Ins TODAY!! CM Students with more than 60 credits, don’t forget the CM Advisors are available from 9:00am to 11:30am and 1:00pm to 4:30pm in the College of Management. Come see us in M-5-610. Here are the MAP Events for the week of October 3, 2016. Please sign into the MAP Student Portal to pre-register for these events and to find room locations.